There is something for everybody at Cub World; from Nature to Swimming, from BB Guns to Climbing. Trained staff will lead your scout through many life changing experiences. Cub Scouts will be outside all day in the weather, and will have comfortable sleeping accommodations. 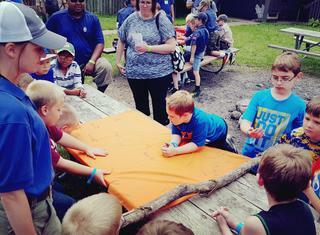 Your Scout will be housed with other Scouts from their Cub Scout Pack. The adult leaders from your child’s pack are housed in nearby cabins or tents. 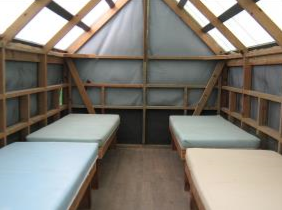 Every cabin has cots or bunks, with mattresses. Our housing areas have different themes. Western Village: A miniature Western Village with themed cabins such as "The Bank," "The Jail," and "The Church." Fort Rice: A fort with walls and watch towers. Scouts can stay in the watch towers with their friends. Housing arrangements depend on your Pack’s reservation. Occasionally, Packs opt to stay in tents. If you are unsure of where your Scout will be staying, contact your Pack leaders. Two shower houses are available with a total of 14 private stalls. Running water and flush toilets are available in several places on camp. Our staff is experienced and receives training following national Boy Scouts of America standards. Our staff also receives expert training and certifications from partner organizations such as the American Red Cross Lifeguarding, American Red Cross CPR/First Aid, climbing certifications following standards set by the Association for Challenge Course Technology, and rangemasters are trained by a certified NRA Training and Education instructor. Camp Phillips is independently inspected and accredited through the National Camp Accreditation Program. All registration is handled through your child's Cub Scout Pack. Your pack leaders will have the resources to register your son for camp. If you have any questions, please contact Terri at our Council Service Center 715-832-6671. Cub Scouts, Scouts and Adult Leaders have called L.E. Phillips their Summer home since 1952. 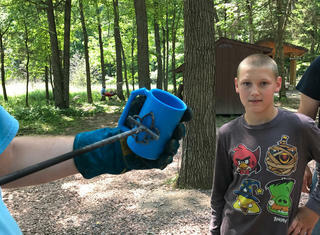 Scouts leave summer camp with new skills, new friends, stronger character and a better understanding of nature. 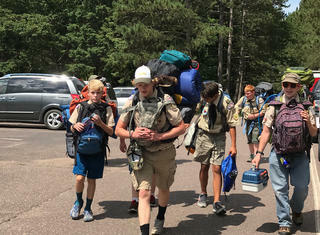 At Camp Phillips, Scouts spend a week in the Northwoods of Wisconsin. The natural beauty of Camp Phillips and its five lakes surrounded by forest is truly one of a kind. Scouts experience programming from 10 program areas where they are challenged and encouraged to meet requirements and reach new heights. Over 45 merit badges are offered. Much of a Scout's time is spent outside. 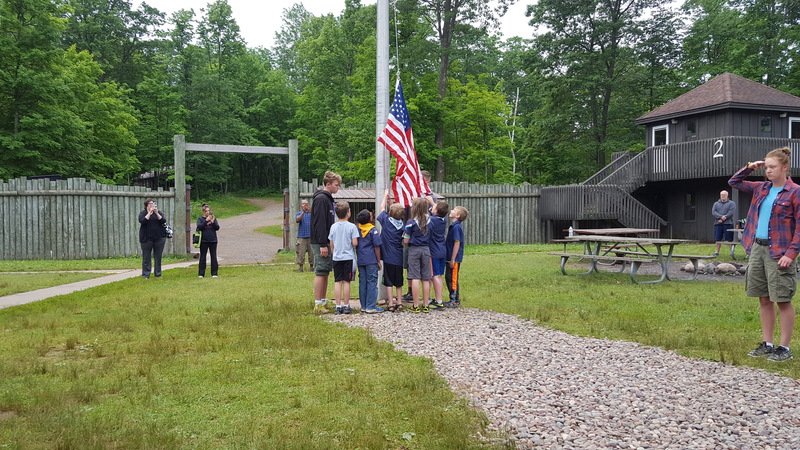 Open programming provides opportunities where Scouts can experience all that Camp Phillips has to offer. The staff at Camp Phillips is highly trained, experienced and encouraging. Scouts will leave Camp Phillips with experiences they will never forget. 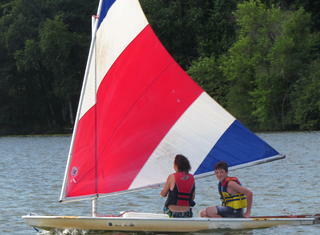 Lake activities include canoeing, stand up paddle boarding, swimming, sailing and kayaking. There is plenty to do at Camp Phillips' rich aquatics areas. 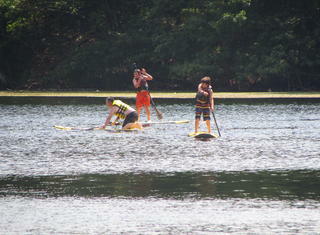 All campsites have lake access and row boats available. 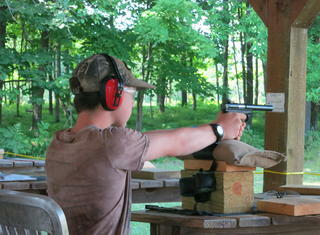 Camp Phillips has the best shooting facilities for Scouts BSA in the United States! Our NRA certified staff will lead Scouts through introductory lessons in archery, rifle and shotgun shooting. As a Scout gets older and more experienced, he can begin advancing his skill level. Some advanced offerings available to older Scouts include trap shooting, pistol shooting and 100 yard rifle shooting. Our nature building is newly remodeled and has opportunities for Scouts to learn about nature in a hands-on experience. 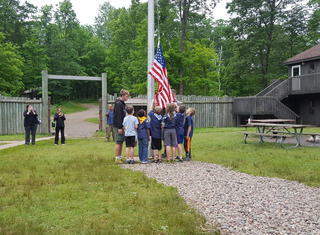 Communication, Citizenship in the Nation, Citizenship in the World and other Eagle Scout required merit badges are offered at Camp Phillips. Our civics staff strives to provide engaging and fun learning experiences in civics, while completing requirements. Scoutcraft is a program area consisting of outdoor skills merit badges and other related merit badges. Scouts have the opportunity to learn and apply basic outdoor skills such as cooking, camping, fishing, orienteering, first aid, blacksmithing and branding. This area is geared towards Scouts that have just joined the adventure of Scouting. 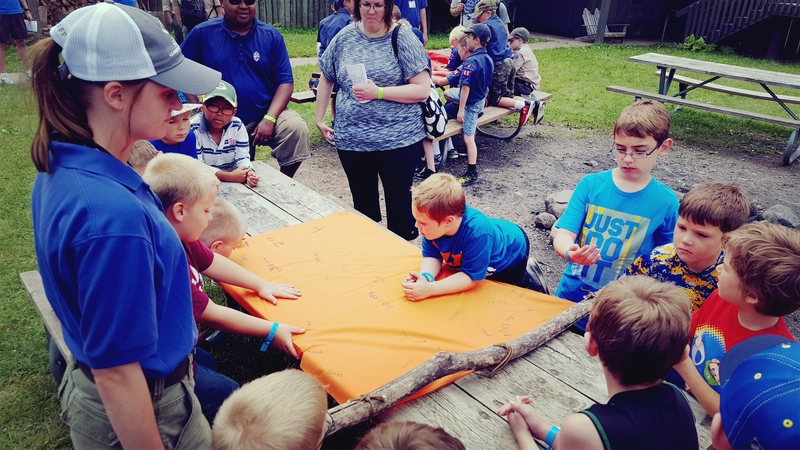 Scouts earn many requirements for the first 3 ranks of Scouting, while applying their new knowledge in camping, knife safety, cooking and knot tying. Project COPE stands for Challenging Outdoor Personal Experience. 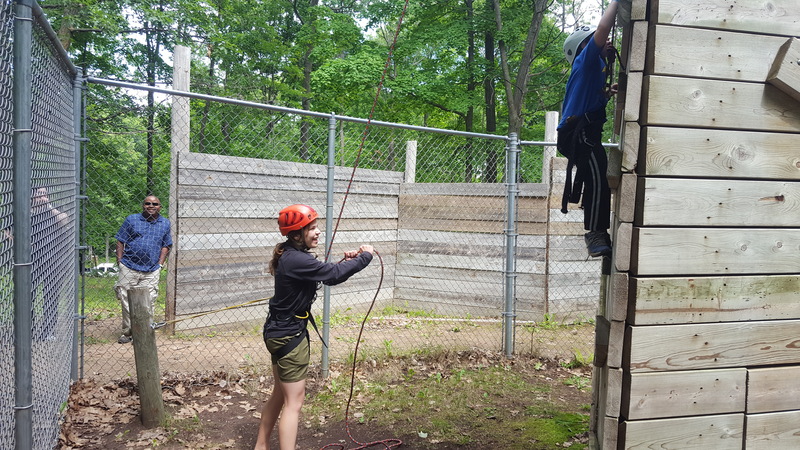 A high & low ropes course is the perfect place for team building, ziplining and pushing Scouts outside of their shells. 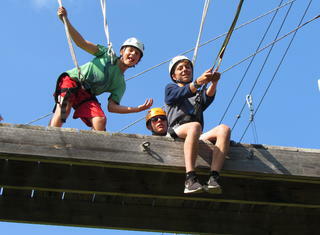 Our challenge courses are independently inspected annually. Our COPE staff completes extensive training in facilitation and equipment inspection. Our Climbing Wall is over 35 feet in height! Scouts will be challenged and encouraged as they climb and learn a new skill. Our climbing wall is inspected annually and climbing and belaying are supervised by trained staff at all times. Scouts stay in one of 12 unique campsites. Our campsites have cabins that feature four bunks with mattresses. All campsites have a pit toilet, running water and lake access. Flush toilets are available in several places on camp. Camp Phillips has two shower facilities, with a total of 20 private shower stalls. 6:00 PM - Chicken Dinner. 8:30 PM - Order of the Arrow Ceremony begins at Chapel. Reservations are strongly encouraged to help ensure enough food will be prepared for your family. Have your scout's troop reserve your spot with Administration, or you can call 715-234-7723 to reserve your spot. You can send payment for reserved chicken dinners with your troop, or you can still pay the reserved rate at the door.